This summer, help your kid advance their tennis game and sign them up for a USTA tournament. 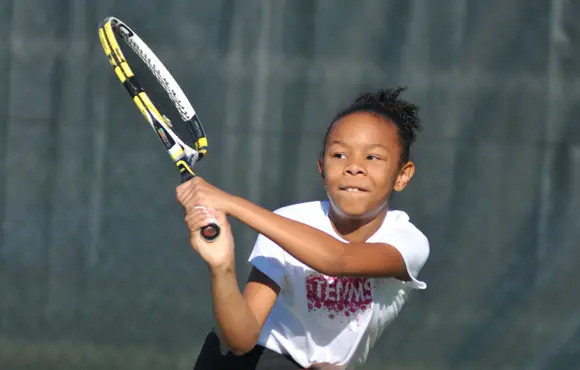 USTA offers a variety of junior tournaments for kids of all ages and levels. Basic skills—the ability to serve, rally, and keep score—required to play in a tournament. A great place to gain these skills are through Play Days, which introduce kids to competition, and Team Tennis. Check out these 10 tennis tournaments just for kids. Or head over to youthtennis.com to find a Play Day near you. This tournament is open to players who have less than 250 points, which are earned by winning singles and doubles matches at USTA national and designated ITF tournaments. If you're interested, don't delay. All players must be registered by June 27. If you miss the deadline, sign up for the Fred Wells Summer Series-10 and Under tournament, which has no point restrictions and will be held July 26, 2014. This entry-level tournament held at the Genesis Racquet Club has 12 and Under and 10 and Under divisions. Scoring for the 10 and Under division will be best two out of three sets with 4-game sets. Scoring for the 12 and Under division will be a single 8-game pro set. Register soon, the deadline is June 30. What better way to end the July 4th weekend than with a little competition. This entry-level tournament is designed for the novice player. The tournament features a round robin format to ensure kids get lots of play time. This entry-level tournament is open to all players regardless of rankings. This year, the Sweetwater tournament has been moved from the Kennworth Tennis Club because of ongoing construction. Be sure to sign up soon; the deadline is June 27. This special Friday night event features three USTA sanctioned singles matches—one set per match—in just three and half hours. The top eight players, based on the most recent USTA Southwest Junior Standings list, will be selected into the draw. The remaining players will be placed into another draw worth half as many points. This advanced-level tournament at the Round Hill Country Club is part of the super series—events that are new to the 2014 NorCal Junior Tournament calendar. Super series are level-based singles tournaments that group players by their ratings into four compass draws for eight players in each division. The final super series event of the year will be held November 22 to November 23 in Fremont, California. The best interscholastic tennis players in the country have the chance to compete at Harvard University in this top-level tournament. All entrants must have participated on their respective varsity high school teams. This entry-level tournament is open to boys and girls under 10 years old. Players will use an orange low compression ball during the matches, which are two out of three short sets. There will be no ad scoring in the matches. This tournament has it all including singles and doubles divisions for boys and girls in the 12- to 18-year-old categories and 10 and Under. Players in the 10 and Under division will use an orange compression ball. This two-day event will be held outdoors on clay. Indoor hard courts will be available as a back up. This is an entry-level tournament and has a draw limited to 16 players to keep matches at a two-per-day maximum.